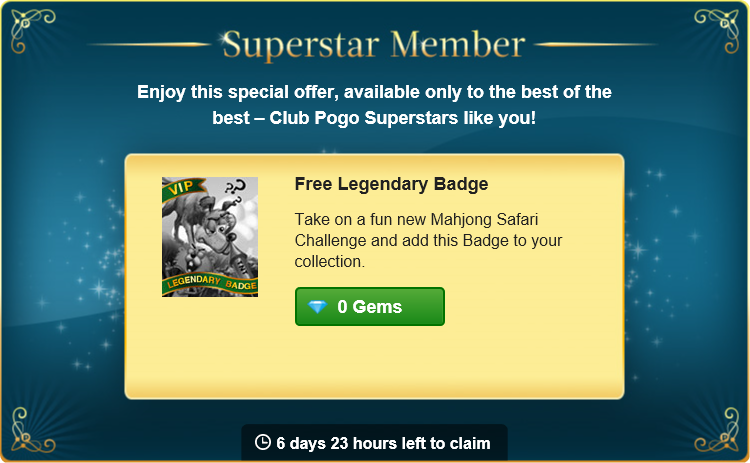 Pogo is offering up a Free Mahjong Safari Legendary Badge for select Club Pogo "Superstar" Members! The pop-up displays over your current Club Pogo page, and you should see it when you log in or visit any of the pogo pages. Mahjong Safari - Bowwow Blastoff Badge - Make 80 5X combos in 2 weeks! My Oh My...I feel like I am stealing from POGO. Maybe a payback for all the Gems I have purchased.